This newly built Dormer House located in a development of three restored stone buildings is just 3 miles outside the village of Clonroche, 10 miles from New Ross and 2.5 miles from Adamstown. Country walks on site as well as hill walking nearby. All properties can be booked together (6225,8278) for a family get together or indiviually for that cosy get away. The owner lives on site and has a few pets, 2 pot belied pigs (Podge & Rodge), ducks, chickens & dog. 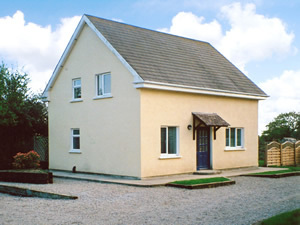 A great countryside retreat with easy access to New Ross, Waterford and the beautiful beaches of Wexford.Shop. Pub 2Ã‚Â½ miles. Restaurant 4 miles. Beach 18 miles. GF: lounge, kitchen, dining room, w.c. FF: 2 doubles, single, bathroom with shower over bath.Fuel and Power supplement of Ã‚â‚¬20 will be charged from Oct - April, Oil and Electricity will be included outside of this., linen and towels included, flame effect fire, travel cot, high chair, stair gate, TV, dvd player, CD, freezer, microwave, dishwasher, w/machine, internet access, hairdryer, uk tv channels, welcome pack, fully enclosed garden, garden furniture, bbq, swings and slide, shared driveway, off road parking. Pets welcome.